Should we make reservations in advance? Yes, most definitely. Jet Ski Tours, Parasailing, WildCat Adventures, Boat Rentals and Boat Charters are very popular, and during the peak summer months we have many visitors who seek fun and adventure on their vacation. You should secure your reservation in advance to avoid disappointment. You can book your tour or rental online on our website, or call our reservations number at (441) 238-4155 or (441) 232-4155. Our Dockyard location phone reservations are handled by a representative of Island Tour Centre, who are only Dockyard Sales booking agents for K.S. WaterSports tours departing from the Royal Naval Dockyard only. Our K.S. WaterSports Hamilton, Southampton and St. George’s location phone reservations are handled by K.S. WaterSports directly. Phone reservations: When making a reservation by phone, make sure you specify which company and adventure you would like to book, (K.S. WaterSports Jet Ski Adventure, K.S. WaterSports Jet Ski & Swim Adventure, K.S. WaterSports Jet Ski & Snorkel Safari, K.S. WaterSports WildCat Adventure or the K.S. WaterSports Parasailing Adventure. Very Important! Why when I call the K.S. WaterSports Dockyard reservation number I get a representative from Island Tour Centre answering the call? Are you the same company? No we are not the same company, and Island Tour Centre is just a booking sales agent for K.S. WaterSports and our Dockyard Location tours. K.S. WaterSports has been established since 2001 as an independently owned and ran business, but in 2010 we decided to partner with Island Tour Centre in Dockyard who are now sales booking agents for K.S. WaterSports and all our Dockyard location adventure tours. They handle all our Dockyard phone and walk in reservations for K.S. WaterSports. K.S. WaterSports is still operated independently and is not affiliated with Island Tour Centre. All emails that are sent to the info@kswatersports.com email address come straight through to us directly. This booking partnership was designed to give our guests an easier and simpler way to walk in and book their tours and rentals which depart from our Dockyard location. Our Hamilton, Southampton and St. George’s location tours, rentals and boat charters are handled by K.S. WaterSports directly by calling (441)-232-4155. If we have a tour or rental booked already at one of your locations, how soon should we show up before our scheduled tour or rental time? You must show up at least a half an hour before your scheduled tour or rental time! This is very important so plan accordingly and make sure you give yourselves plenty of time to get to our locations early. No refunds will be given to persons who are late, missed their tour or didn’t show up. Also please make sure you show up to the correct location for your tour or rental! See our locations page for information on how to get to any of our 4 locations. Boat Rental guests must ensure that they arrive 30 minutes before their rental time as this will guarantee that a K.S. WaterSports representative will be there on site to give you and your group their orientation prior to your boat rental departure. (If you’re group is running late then we will still require the driver of the rental boat to be at our facility 30 minutes prior to their scheduled departure time, to receive their boat orientation and instructions on boat safety and boat operation). Very Important! Yes we do. We require 24 hours advance notice before your tour or rental departure time. You must speak to a representative of K.S. WaterSports or Island Tour Centre to cancel your booking, not a message left on our answering machine or an email. Please make sure you call the correct K.S. WaterSports branch where you made the reservation with. No refunds will be given for any persons who missed their tour or rental time or did not show. A full refund will be issued if a tour or rental is cancelled prior to the 24 hour notice. Please note that all our K.S. WaterSports boat rentals have a 48hr cancellation policy requirement. Public Holidays: We require 48 hours advance notice to cancel a rental boat reservation on a public holiday also. Do you need ID (Identification) to partake on any of the tours? Identification is only necessary for persons 21 years or under who are driving a Jet Ski on one of our Jet Ski Adventure tours. The legal minimum driving age on a Jet Ski Tour is 16 years old, but ID must be shown for all drivers 21 years old or younger. ID is not required for Parasailing, WildCat Adventures, Jet Ski passengers, or Jet Ski Drivers 22 years or older. We accept MasterCard, VISA, Amex and Cash. To secure a Jet Ski, WildCat or Parasailing Adventure time slot in advance, you must pay up front in full with a credit card or with cash. This also applies for all our boat rentals, pontoon rentals, kayaks and paddle board rentals too. What Experience do you need to participate in the tours? No experience is required to participate on our Parasailing Adventure & Eco Tour, Parasailing Adventure, WildCat Boat Tours and Jet Ski Adventures. Beginners are welcomed. Instructions and Orientation will be provided to all participants before departing for a tour. Are there any age restrictions for your tours and rentals? Boat Rentals – No infants or children under 1 years old permitted onboard. All boat renters/drivers must be 18 years or older to rent or drive. Viking Luxury Yacht Charter – No children under 7 years old. Do you have lockable storage at your facilities to put our belongings in? Yes we do have dry lockable storage at all four(4) of our water sports facilities (in Dockyard, Southampton, Hamilton & St. George’s). Space is limited so please bring the fewest amount of belongings with you. No big bags, backpacks, coolers, or large items please. Our Cruise Ship docks at Kings Wharf or Heritage Wharf but we have a Jet Ski Adventure booked already departing from St. George’s. How do we get to your St. George’s location? If you have a Jet Ski Adventure reservation booked already which departs from our St. George’s location, then walk over to the Sea Express Ferry Terminal in Dockyard and take it to St. George’s which normally takes around twenty minutes to get there once onboard the Fast Ferry. When you arrive in St. George’s just walk over to K.S. WaterSports which is located at the White Horse Pub & Restaurant. Please make sure you view the correct Ferry schedule times for that day and give yourselves plenty of time to get to our location at least a half an hour before your scheduled tour time. Alternatively you could use other methods of transportation like buses, taxies, mopeds, or mini buses if staying at hotels or guest houses. Our Cruise Ship docks at Penno’s Wharf or Ordnance Cruise Ship terminal in St. George’s, but we have a Jet Ski Adventure, Parasailing Adventure or WildCat Adventure departing from your Dockyard location. How do we get to your Dockyard Location? 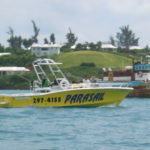 If you have a Jet Ski Adventure, Parasailing Adventure or WildCat Adventure booked already which departs from our Dockyard location, then walk over to the Sea Express Ferry Terminal in St. George’s and take it to Dockyard which normally takes around twenty minutes to get there once onboard the Fast Ferry. When you arrive in Dockyard just walk over to K.S. WaterSports which is located at the “Dockyard Watersports Centre” which is right next to the Dockyard Ferry Terminal and across the street from the Bonefish Bar & Grill. Please make sure you view the correct Ferry schedule times for that day and give yourselves plenty of time to get to our location at least a half an hour before your scheduled tour time. Alternatively you could use other methods of transportation like buses, taxies, mopeds, or mini buses if staying at hotels or guest houses on the island. Our Cruise Ship docks at the Hamilton Cruise Ship terminal, but we have a Jet Ski Adventure, Parasailing Adventure, or WildCat Adventure departing from your Dockyard or St. George’s location. How do we get to either Location from Hamilton? 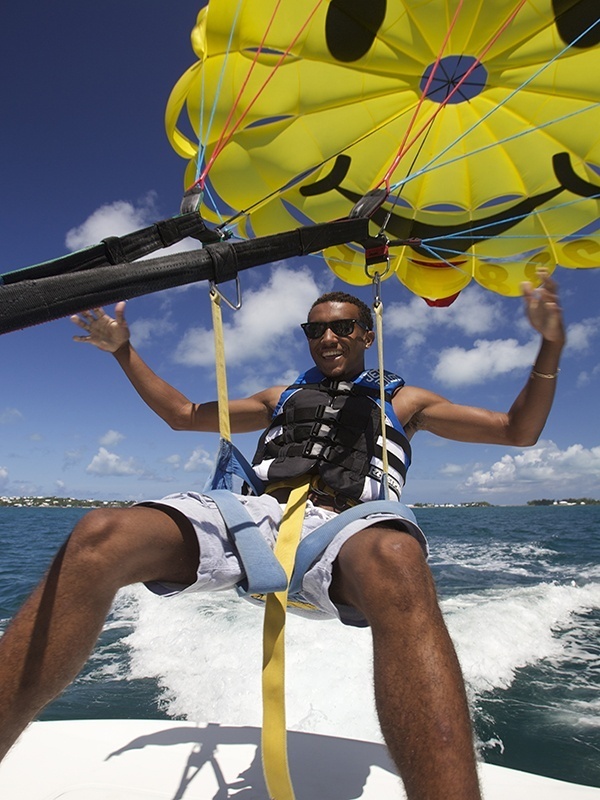 If you have a Jet Ski Adventure, Parasailing Adventure or WildCat Adventure booked already which departs from our Dockyard or St. George’s location, then walk over to the Sea Express Ferry Terminal in Hamilton and take the Fast Ferry to Dockyard or St. George’s. When you arrive in Dockyard or St. George’s just walk over to K.S. WaterSports which is located at the “Dockyard Watersports Centre” in Dockyard, or at the White Horse Pub & Restaurant in St. George’s. 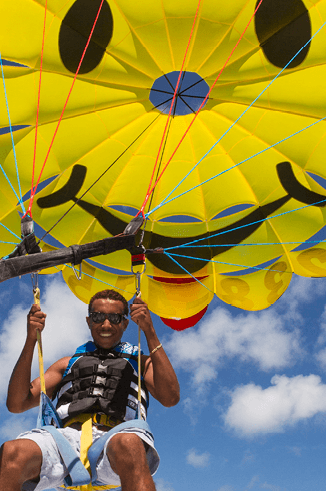 Please be advised that Parasailing and WildCat Adventures operate from our Dockyard location only at this time. Jet Ski Adventures are available from all three of our locations – Dockyard, Hamilton and St. George’s. Please make sure you view the correct Ferry schedule times here for that day and give yourselves plenty of time to get to our location at least a half an hour before your scheduled tour time. Also make sure you take the Fast Ferry to the correct K.S. WaterSports branch where your scheduled tour departs from. Alternatively you could use other methods of transportation like buses, taxies, mopeds, or mini buses if staying at hotels or guest houses on the island. I see that you operate out of 4 different locations for your Jet Ski Adventures. Are there any differences in these tours? How long are the Jet Ski Adventures? It all depends on which Jet Ski Adventure you choose. Our regular Jet Ski Adventures are 75 minutes long and are Jet Ski Safaris are 2 & 3 hours long (Meaning driving time an being out on the water). Customized, private and longer Jet Ski Adventures are available upon request as well and is based on availability. How many Jet Ski’s go out at any one time? Up to Six(6) rental Jet Ski’s maximum per tour guide go out at any one time. This is to ensure that groups are able to ask questions and hear what their tour guide has to say and wants to point out. We can accommodate larger groups of seven(7) or more Jet Skis upon request. We have the largest amount of Jet Ski’s (60+) available than any other Jet Ski rental company in Bermuda, which means more availability and times for you to get out on the water. Are there any restrictions to be able to partake on a Jet Ski tour? – Women who are 3 or more months pregnant. – Persons who have limited mobility. – Persons who have any heart related issues or seizure related issues. – Persons who do not have the strength to pull themselves back up onto their Jet Ski in a deep water boarding situation. * Please note that all participants will need to fill out and sign a liability waiver prior to partaking on any of our Jet Ski tours. Are there any weight restrictions to be able to operate a Jet Ski or take this tour? The maximum weight limit (per person) allowed on a Jet Ski is 300lbs max. The reason for this is to ensure that you can get back up on the Jet Ski safely if you fall off or are in a deep water boarding situation. Boarding a Jet Ski from the water can be very difficult for persons 300lbs or over. For double person Jet Ski’s or triple person Jet Ski’s, (meaning 2 persons on 1 Jet Ski or 1 adult and two small children on 1 triple Jet Ski), the maximum combined weight limit allowed is 375lbs. This weight limit ensures that persons can enjoy their Jet Ski adventure together and do not risk the constant battle of rolling over the ski and falling off over and over again, due to being over the 375lb maximum combined weight. Safety and fun is our top priority, and these weight restrictions ensure that all guests will have the maximum fun and adventure while on our Jet Ski tours. As a rule of thumb: The more passenger weight you add to a Jet Ski the harder it is for the driver to steer, control, and stay on the Jet Ski without tipping over or falling off. 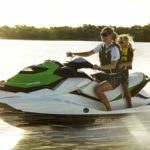 Beginners or persons who have not Jet Skied before or who haven’t Jet Skied for a very long time will have an easier and much better time and experience as a Single Jet Ski user – without any passengers, or as a double Jet Ski with a samller and lighter passenger on the back only, like a child or young adult. Persons with experience driving a Jet Ski or who feel comfortable with driving a Jet Ski should be fine with a passenger on the back of their jet ski as long as they do not exceed the maximum combined weight of 375lbs. Triple Jet Ski’s are only recommended for 1 adult and two small children (or) 2 adults and 1 small child as long as they do not exceed the combined maximum weight limit of 375lbs per Jet Ski. Beginners and non experienced drivers should not consider renting a triple Jet Ski (meaning 2 passengers on the back of their ski). Triple Jet Ski’s can only be reserved by walk in or over the phone, (Not online). Since this is a guided tour, are your Jet Ski Adventures & Tours slow or are they fairly fast paced? Our Jet Ski Adventures & Tours are considered to be high-speed guided tours (35mph minimum travelling speeds), but in no way are dangerous or unsafe at the speeds we travel at. 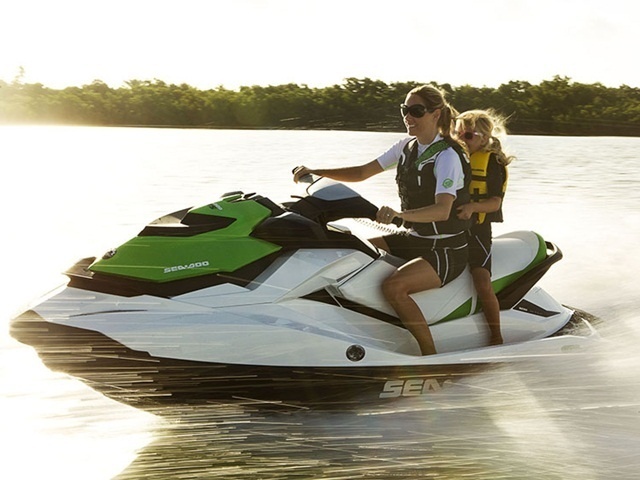 Our 4-Stroke Sea Doo GTI and Yamaha VX models can travel up to speeds of 50mph! With that being said there are many portions on the tour where we do have to slow down when entering bridges, narrow openings, shallow waters and during our stops. The best way to describe if this Adventure is right for you is: if you are looking for a slow paced tour similar to the speed of what a tour boat or glass bottom boat would travel at (meaning under 20mph), then this is not the tour or adventure for you. Jet Ski’s are meant to be driven at speeds of around 35 mph or more for them to become fun, stable and to turn correctly. What Experience do you need to participate on any of the Jet Ski Adventures? No experience is required to participate on our Jet Ski Adventures. Beginners are welcomed. Instructions/Orientation will be provided to all participants and drivers before departing on their Jet Ski. Our tour guides will also be there to help assist you as well during the tour when needed. Please keep in mind that for our Jet Ski Adventures all drivers must be prepared to operate the Jet Ski’s at the same speeds as the Tour Guides and Group, and can expect to be travelling at minimum speeds of around 35mph while on these tours. These tours are not recommended for persons who have no experience driving any other types of motorized vehicles, and it is recommended that they should go as passengers when in doubt of being able to handle driving a Jet Ski at normal cruising speeds of around 35+mph. I see you have 3 seater Jet Skis available for rent, why do you not recommend this option for novices or beginners? Even though no experience is required to participate on our Jet Ski Adventures, beginners and novices should avoid having three persons on one Jet Ski because it can become extremely difficult to drive the Jet Ski and also risks you frequently capsizing and rolling over the ski, which is no fun for you or your passengers and could damage the jet ski. We only recommend 3 persons on 1 Jet Ski for one average sized adult (185 lbs or less) plus two children weighing less than 90lbs each. We like our customers to have fun while on tour with us, and this can be achieved better on a single or double Jet Ski normally. Please keep in mind that each ski has a maximum weight limit of 375lbs. What should we bring to wear? Generally you should bring a towel and a bathing suit. It is recommended that you are wearing your bathing suit prior to the tour due to the lack of changing facilities at our locations. Some other things to consider are waterproof cameras, sun block, sunglasses or swim goggles, and a small plastic bottle of water. It is not recommended to bring hats because they will not stay on during the tour. Sun tan lotion and glass beverage bottles are not permitted to be stored in our Jet Ski’s during the tour. We have dry lockable storage on our floating docks at all 4 of our watersports locations, which is suitable for small amounts of belongings and towels for when you return from the tour. Do we have to take a guided tour? Yes, it is by Bermuda law that all rental Jet Skis are accompanied by a tour guide in Bermuda. The guided tour however is a lot of fun and fast paced, and most people who are skeptical at first come back saying it was better than if they had gone out on their own. Nobody knows our island like we do, and we know all the best places to take our guests. 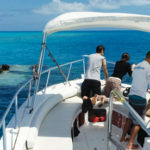 Also from a safety stand point, Bermuda is surrounded with coral reefs that lie right below the surface sometimes and are hard to see, so by going on a tour with a tour guide will also ensure that you do not get into a situation and can just focus on having fun on the water while enjoying the gorgeous scenery around you. Are routes guaranteed on every Jet Ski Adventure? As much as we would like to say yes, due to changing weather/sea conditions and colder temperatures in the early parts of the year, sometimes we must alter routes and courses of our Jet Ski Adventures so that our customers have the best overall experience. The tour descriptions and routes listed on our website is where we mostly take our tours when weather conditions are good, which in Bermuda is almost all of the time. I see you offer a Special 2 1/2 Hour End to End Jet Ski Safari, why is there no schedule for this excursion? This End to End Jet Ski Safari is considered to be a Special Tour and is subject to availability and weather conditions, and is not offered on a day to day basis. These are mostly Private tours and for larger groups, and you must book a minimum of three Jet Ski’s total for your group to be able to partake on this 2.5hr Adventure. This Adventure consists of more driving time and swim time and is not recommended for novices or persons who tire very easily or have any previous medical conditions or surgeries. The WildCat is a 50 Foot high-speed catamaran boat powered by twin 1000 HP diesel motors that takes up to 54 passengers on an exhilarating & fun adventure around various parts of the island. WildCat’s specialized design gives her both speed, comfort and stability, not to mention it is one awesome ride! How long are the WildCat Adventures? How many passengers does the WildCat take per trip? The WildCat holds up to 54 Passengers per trip. How fast does the WildCat go? Well, we can’t tell you all our secrets, but what we can say is that the WildCat is designed to carry passengers in complete safety and comfort at high-speeds (ranging anywhere from 30mph up to 55mph). We never operate the WildCat in sea conditions that would be considered unenjoyable to our guests, nor do we travel at speeds that would be considered unsafe or too fast for the current sea conditions. Our WildCat Adventures are sold as high-speed sightseeing adventure tours but we make several stops along the way and we have many slow down areas where we cruise along pointing out the islands historical sites and other points of interest. Our seats are all cushioned and padded to provide you with the maximum amount of comfort while on tour. Is the WildCat Safe, considering it is offering high-speed sightseeing tours? Absolutely! The WildCat is designed for the sole purpose of sightseeing, and she offers a very safe, smooth and comfortable fun ride with the added benefit of being able to go fast when necessary and allowing you, the guest, to see more of the island in less time. Please look at each description of the WildCat Adventure you are interested in. This will tell you all about the routes and where we go and will also have a “Roar Meter” attached to it that will show you the level of intensity each Adventure provides. We have an adventure to suit just about anyone of any age who is looking to see a lot of the island and wants to have some fun and adventure on their vacation! The WildCat Adventures are suitable for persons of all ages, but children under 5 years old may not participate. What Experience do I need to participate on any of the WildCat Adventures? No experience is required to participate on our WildCat Adventures. Are there any restrictions which could prevent me from participating on any of the WildCat Adventures? The WildCat Adventures may not be suitable for women who are pregnant, children under the age of 5 years old, persons 300 lbs or heavier, or people with conditions that may be affected by a high-speed ride. If you suffer from severe back problems and/or struggle with constant back pain then the “Round The Island Adventures” may not be the adventure for you. I want to see a lot of the island from the water, so why should i choose the WildCat over the typical sightseeing tour? Well first of all, Bermuda has many tour boats and tour companies that offer great tours throughout the island. All I’m sure are fantastic in their own way. What makes the WildCat unique is that it provides a new and exciting way to see more of the island in less time, which results to lots more pictures, more adventure, and more fantastic memories that will last a lifetime! The WildCat’s design gives you a complete 360 degree view of the sites around you, plus its the only type of sightseeing tour which provides its guests with fun and adventure along the way. Just imagine the wind blowing through your hair, with music playing in the background while you skim over the islands gorgeous aqua blue waters. This is the WildCat! All our WildCat Adventures make several stops along the way, and come with an entertaining narrated tour of the islands historic sites and other points of interest. How much does the WildCat Adventures cost? Please see the Rates page on our website for pricing on all of our WildCat Adventures. Where do we meet to board the WildCat once we have booked our Adventure? All of our WildCat Adventures depart from our Dockyard Location, located right next to the Dockyard Ferry Terminal and across the street from the Bonefish Bar & Grill. See our Locations Page for details and maps on how to get to our Dockyard Facility. Just a 2 minute walk from Kings Wharf and Heritage Wharf Cruise ship terminals to our Dockyard location. What should we wear or bring when going on the WildCat? Do you have a lockable storage area to secure belongings? Generally you can come dressed in a bathing suit, beach attire, or regular clothes, its up to you. Our recommendation is wear a bathing suit just in case of the odd rain shower that happens to come down that we couldn’t avoid, or if you decide to participate on our WildCat Coastline & Swim Adventure. Some things to also consider bringing with you are waterproof cameras, sun block, sunglasses, and a small plastic bottle of water. You can wear hats if you like but be weary that they may not stay on during parts of the tour when we are traveling at higher speeds. Glass beverage bottles, large bags or backpacks, coolers and aerosol sun tan lotion are not permitted onboard the boat and must be stored in our lock box prior to the tour departing. We have dry lockable storage boxes on our floating dock for small amounts of belongings to go in. Please no large bags, backpacks, snorkel equipment or coolers though. Rule of thumb: If you can fit it in your pocket or under a seat, then bring it! It is recommended that you put on sun tan lotion prior to boarding the WildCat, to avoid creating a slippery surface for others to walk on. Sunglasses are recommended to bring with you as well if you have them. Do you get wet while on tour? Well, the answer to this is not really, unless a freak rain shower happens to get us while driving. We do try to go around the small rain squalls mostly when they’re out there, but hey, this is the WildCat and it’s all about having fun and adventure outdoors and on the water! Generally you do not get wet at all while on tour, but if there are slightly choppy waters out there then very mild splashing can occur on the odd occasion. The WildCat is a very dry boat, and minor splashing can only occur when the conditions outside are very very rough and breezy, and we don’t typically operate in extreme conditions like that, even if the boat can handle it. Are routes guaranteed on every Wildcat Adventure? As much as we would like to say yes, due to changing weather/sea conditions, sometimes we must alter routes and courses so that our customers have the best WildCat experience possible. The tour descriptions and routes listed on our website are exactly where we take you when weather conditions permit us, which in Bermuda is almost 99% of the time. Sometimes for example if the seas are very rough on one side of the island, like South Shore, we would re-route to one of our other WildCat routes/adventures which would provide better waters to operate in. This rarely happens though but just know we have a backup plan and route always that will be just as good as the original Adventure you chose. I took the WildCat many years ago? Do you offer this same tour? Since 2012, The WildCat has been owned and operated by K.S. WaterSports Bermuda. We are offering different WildCat Adventures/tours to choose from daily that will suit persons of all ages looking for the ultimate sightseeing adventure and who like to vacation in the fast lane! We will be offering the “Round The Island Adventure” that will be similar to what the WildCat did previously, but with some extra sightseeing areas and stops to see plus many more thrills along the way too. However, if sea conditions restrict us from going around the entire island then we will re-route and take you on a 2 Hour action packed adventure that will be a combination of our other adventures, and we will take you around as much of the island as possible where weather conditions are good. Safety and fun is our top priority and we want everyone to have a great time and experience while onboard! Where is the meeting point for Parasailer’s who have already booked Online or made an advance reservation? All persons already booked on the K.S. WaterSports Parasailing Adventure & Eco Tour must be at our location no later than a half an hour before their scheduled departure time. You will need to go to the “Dockyard Watersports Centre” in Dockyard, located near to the Dockyard Ferry Terminal and directly across the street form the Bonefish Bar & Grill. See our Locations page for maps and details to this location. 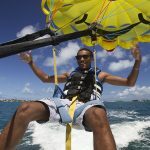 I was told that you only offer Parasailing at your Dockyard Location/Branch? Yes that is true. 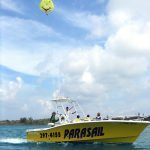 Parasailing will only be operated out of our Dockyard location/branch at this time. If traveling from Hamilton or St. George’s, the quickest and cheapest way to our Dockyard location is by Fast Ferry. See the “Sea Express” Ferry schedule, here. How long do you get up in the air? 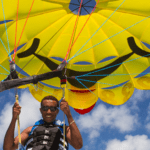 How much does the Parasailing Adventure & Eco Tour cost? 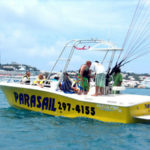 Please see the Rates page on our website for pricing on our Parasailing Adventure. What is the maximum amount of people that can go on the boat at any one given time? 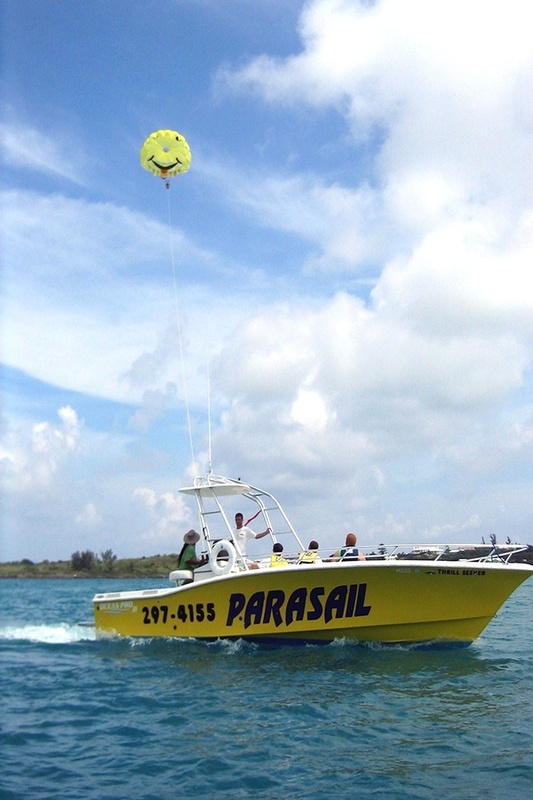 Our Parasail boat “Thrill Seeker” can take a maximum of 12 people at any one given time. I have heard that when parasailing, some operators prefer to use a sit down chair instead of a harness – which one do you use? We use an independent harness that fits adults and children of all sizes. 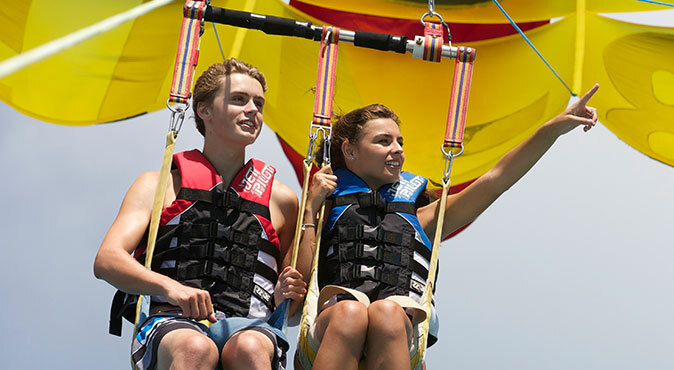 We can fly two people at one time depending on the total weight of both persons and wind conditions. An added benefit is that you are able to see a lot more when you are secured in a harness as opposed to a sit down chair. Is there a weight limit to go parasailing? The maximum weight limit per person must not exceed 300lbs, and if flying double tandem or triple tandem (meaning 2 persons or 3 persons together) then the maximum total combined weight allowed is 325lbs. Children weighing less than 100lbs must fly double tandem with an adult or another person, for safety reasons. Can two people go up together? Yes they can, but keep in mind that both persons cannot exceed 325lbs (combined weight), and the wind direction that day can vary the total maximum weight limit allowed. In the end the Boat Captain will determine whether 2 people can go up together. Safety is our top priority! Triple Tandem is available, but the maximum combined weight limit must not exceed 325lbs. Triple tandem is mostly used for lighter adults or small children who want to fly together. Do you get wet when parasailing and what should I wear? Normally you do not get wet when parasailing, but some minor splashing can occur while on the boat depending on water conditions. It is recommended that all persons partaking on this Adventure wear their bathing suit and bring a towel with them for when they return. Also due to limited amounts of storage space on the boat, please bring fewer amounts of belongings with you, no large bags, big items or portable beach coolers etc. We do however have a lockable storage area available on the dock. I have never been Parasailing before, how do we take off and land? 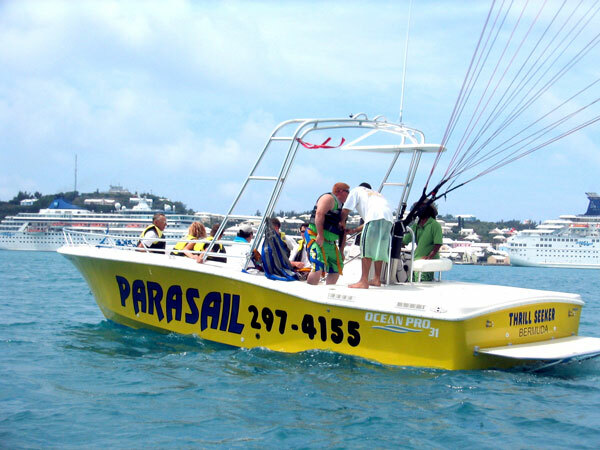 All take offs and landings are done right on the back platform of our Parasail boat, and all take offs and landings are very gentle and easy, no jerking or slamming down of the body or legs. Basically we will do all the work for you, so sit back and relax and enjoy the beautiful sights around you. Can we take pictures while parasailing? Yes you can. It would be advisable to bring a waterproof camera or a camera with a strap that can go around your neck or wrist. Please be advised that bringing any personal belongings with you will be at your own risk. If you like, our crew can take a few pictures of you parasailing with your camera, if you rather not take it up with you. I do not want to go up parasailing but I would like to go on the boat and watch. Is this possible? Yes it is possible but only if the boat isn’t full. We reserve the spots on the boat first for people who are going parasailing (Flyers Only). If there is room available just before the departure time you will be allowed to go on the boat to watch and to experience just the eco sightseeing portion of the tour, for a minimum fee of $50.00 per watcher. What kind of experience do I need to rent a boat? Boston Whaler Rental Boats – Prior boating experience is always helpful, but not required for renting any of our Boston Whaler rental boats. No experience or license is required but all renters must be able to speak, read and understand the English language fluently in order to receive a thorough Safety Orientation and to go over the map provided prior to departure. We will show you everything you need to know! Our rental boats are safe, fun and easy to control for all skill levels. Pontoon Rental Boats – Pontoon Boat Renters must have a person in their group/party who has previous boat driving experience and is willing to drive the 23ft Pontoon Boat the entire time – not for beginner drivers who have not driven a boat before! (You do not need a boating license per say to rent our pontoon boats, but if upon arrival/giving our safety orientation we discover that the driver does not have basic boating knowledge or previous boat driving experience – then your pontoon boat rental will be terminated immediately for safety reasons. All renters must be able to speak, read and understand the English language fluently in order to receive a thorough Safety Orientation and to go over the map provided prior to departure). If you are interested in taking out our larger charter boats out on the water, you can hire one of our 23’, 28’, 31′ or 55’ private charter boats which comes with a local licensed captain/guide to drive you around to experience Bermuda the way us locals do. Should I make reservations in advance? Yes you should. Our boat rentals are very popular throughout the year so it is highly recommended to book your rental boat in advance to avoid disappointment. All boat rental reservations must be secured with a credit card. There is a 48hr cancellation policy for all boat rentals. Public Holidays/Bank Holidays also require 48hrs advance notice to cancel a reservation. Can we pay for our boat rental with cash? Unfortunately we do not permit any of our rental equipment (meaning boat rentals, kayaks, stand-up paddle boards, or snorkel gear) to be paid for with cash. All rental boats/equipment must be paid for and secured with a valid credit card (MasterCard or Visa Card accepted). This credit card will also be used to secure the required damage deposit upon renting, unless you would like to use a different credit card upon arrival. Do you hold a damage deposit for your boat rentals? Yes we do. A $500 amount will be held against your credit card upon your rental, and will be released at the end of your rental providing that the equipment and boat was returned in the same condition as you rented it, and nothing was damaged, lost or stolen. All drivers/renters must provide a valid Visa or MasterCard credit card to use as a damage deposit, and are responsible for all equipment and the boat while renting. You will also be required to sign the damage agreement and a liability waiver upon your arrival. A K.S. WaterSports employee will check over the rental boat upon your return to the dock/pier. Which K.S. WaterSports Locations can I rent boats from? At this current time you can rent boats from our Hamilton, Southampton and St. George’s locations. Depending on the time of the year, we can also deliver our rental boats to our Dockyard location for a small fee. Guests arriving on cruise ships at Kings Wharf, Heritage Wharf, or at the City of Hamilton, should look at renting from our Hamilton location which gives you the added benefit of seeing more landmarks and wonderful sites around Bermuda and its harbors, and is close to all the small beaches and amazing places to relax at, swim or snorkel. Also for Dockyard cruise ship guests you have the convenience of using the Sea Express Fast Ferry service to Hamilton which departs from Kings Wharf and Heritage Wharf cruise ship terminals. How many persons do your boats carry? Depending on which rental boat you choose will determine the overall total person capacity. Our 16’ Boston Whaler boats carry up to 4 average 185lb persons, but K.S. WaterSports recommends 4 (185lb) adults and 1 small (80lb) child for best overall boat performance and comfort. Our 13’ Boston Whaler boats carry up to 3 average 185lb persons, but K.S. WaterSports recommends 2 (185lb) adults and 1 small (80lb) child for best overall boat performance and comfort. Our 23’ Pontoon Boats carry up to 10 average (185lb) persons onboard comfortably. (All rental boats perform based on passenger capacity. The more weight a boat has or carries, will affect its overall speed and performance. All our rental boats have brand new 4-stroke engines on them and our rental boats are practically band new and in great condition). What are your boat rental times each day? All rental boats must be back at the dock no later that 6pm each day, by Bermuda law. Can I rent a boat by the hour? We do not rent boats by the hour. All our rental boats are rented by half day (4hrs) or full day (8hrs) only. You can choose from half day morning rentals, half day afternoon rentals or full day rentals. What do you provide for persons who do not know the waterways around Bermuda? All of our boat rentals come with a detailed map of Bermuda and its waterways, plus we also include our own detailed laminated map which outlines key spots, nearby landmarks and amazing places and things for you to do and see. It also shows how to get to and from our facility as well. All our rental boats come with a full set of safety gear, full tank of fuel, life jackets, and more. 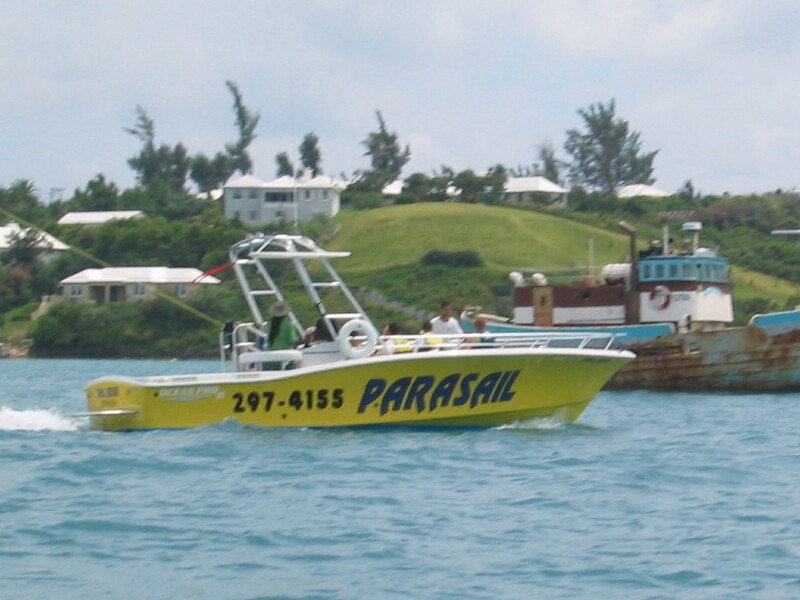 Can you rent a boat on a public holiday in Bermuda? Where can I go with the rental boat? Are there any restrictions? Depending on which of our rental boat locations you rent from, determines where you can go with your boat rental. If renting from our Hamilton Water Sports Location or Southampton Water Sports Location you can take the boat to the central and western parts of the island, which has many beaches, shipwrecks, turtle spotting areas, snorkeling areas, and more to explore and enjoy. Boats rented from our Hamilton and Southampton Location must not go past Admiralty Park/Deep Bay and are not permitted on Bermuda’s South Shore or Southern Coastline. If renting from our St. George’s Water Sports Location you can take the boat to the eastern side of the island, including Castle Harbor, St. George’s Harbor, North Shore, and up to but not past Flatts Village & Inlet. The eastern side of Bermuda has many beaches, old shipwrecks, turtle spotting areas, forts, snorkeling areas, sandbars and more to explore and enjoy. Boats rented from our St. George’s Location must not go past Flatts Village & Inlet and are not permitted on Bermuda’s South Shore or Southern Coastline or in offshore waters. All our rental boats have the required safety equipment, anchor, ropes, etc onboard. Please visit our boat rentals page to see a list of all the accessories our boats have and come with. What is included with the rental boat? Depending on which rental boat or pontoon boat you choose, determines what extras it comes with. All our rental boats have the required safety equipment, anchor, ropes, etc onboard. Please visit our boat rentals page to see a list of all the accessories our boats have and come with. Is there a canopy top for shade on your rental boats? Yes there is. All our rental boats come with a manufacturers canopy or shade. For St. George’s boat renters who are planning to go into Castle Harbor, please be aware that the canopy/bimini top must be lowered first prior to going under the low lying bridges when entering and leaving the Castle Harbor area. What is the minimum age to drive or rent a boat? All boat renters must be 18 years old or older. Any drivers 21 years or under must bring a valid Photo ID. What is the minimum child’s age to be a passenger onboard? Minimum age requirement as a passenger on our rental boats is 1 years old. We do not allow infants and children under 1 year old onboard any of our boats, due to safety reasons. Are there any restricted uses on or for the rental boats? Do you provide lessons or instructions on how to operate your rental boats? Yes we do. All boat drivers and operators will get a thorough orientation/lesson from a K.S. WaterSports representative on how to drive, dock and operate the boat in a safe manner, plus where the best places are to go to make the most of your time while out on the water. For our 23′ Pontoon Boat Rentals, the driver must have previous boat driving experience and basic boating knowledge. Pontoon Boat Rentals are not permitted for first time boat drivers! Can I drop off the rental boat at another location other than where I rented it from? All rental boats must be returned to the same location it was rented from, and on time! Any boats returning back to the dock late or 15 minutes after their scheduled return time will be charged accordingly by the hour or for the entire day. Please ensure that you bring the rental boat back to our facility on time and plan accordingly. What happens if the weather is bad or it is forecasted to be bad on the day of our boat rental? As long as you are not within the 48 hour cancellation period, you have the opportunity to cancel your rental with no penalty. We strongly recommend for you not to cancel your boat rental due to weather predictions and upcoming forecasts, because very often the forecast is incorrect and the day might be beautiful and great on the water. Also weather and sea conditions in one area of the island may be different from our area during the time of your rental. So this is why we wait till the day of to make a final decision. Our refund policy states that guests will be refunded in full if they cannot go out on the water because of bad weather or if the water conditions are considered to be unsafe and dangerous. The best time to make the final decision is within 2 hours of the start of your rental. This way we will have the most accurate forecast. How fast do your rental boats go? Our rental boats are fairly quick and easy to control and maneuver, and will get you to and from places in a reasonable amount of time. K.S. WaterSports has some of the best quality rental boats on the water, and all our boats have new 4-stroke engines on them. Rental boats that are near the maximum passenger weight capacity of the vessel will affect boat speed and performance though. What is the passenger weight capacity of your rental boats? Maximum weight limit per boat must not exceed the manufacturer recommendations. (For safety reasons). Depending on which rental boat you choose will determine the overall total person and weight capacity. Our 16’ Boston Whaler boats carry up to 4 average (185lb) persons but K.S. WaterSports recommends 4 (185lb) adults and 1 small (80lb) child maximum for best overall boat performance and comfort. Our 13’ Boston Whaler boats carry up to 2 average (185lb) persons but K.S. WaterSports recommends 2 (185lb) adults and 1 small (80lb) child maximum for best overall boat performance and comfort. Our 23’ Pontoon Boats carry up to 10 average (185lb) persons maximum onboard for best overall boat performance and comfort. (All rental boats perform based on passenger capacity. The more weight a boat has or carries, will affect its overall speed and performance. All our rental boats have brand new 4-stroke engines on them and our rental boats are practically band new and in great working condition). Our Cruise Ship docks at Kings Wharf or Heritage Wharf but we have a Boat Rental booked already departing from Hamilton. How do we get to your Hamilton location? If you have a boat rental reservation booked already which departs from our Hamilton location, then walk over to the Sea Express Ferry Terminal in Dockyard and take the fast ferry to Hamilton which normally takes around 10 minutes to get there once onboard the Ferry. When you arrive at the Hamilton Ferry Terminal just walk over to K.S. WaterSports which is located at the Hamilton Princess Hotel & Marina, a 8-10 minute walk away. Please make sure you view the correct Ferry schedule times for that day and give yourselves plenty of time to get to our location at least a half an hour before your scheduled rental time. Alternatively you could use other methods of transportation like buses, taxies, mopeds, or mini buses if staying at hotels or guest houses. Our Cruise Ship docks at Kings Wharf or Heritage Wharf but we have a Boat Rental booked already departing from St. George’s. How do we get to your St. George’s location? If you have a boat rental reservation booked already which departs from our St. George’s location, then walk over to the Sea Express Ferry Terminal in Dockyard and take the fast ferry to St. George’s which normally takes around twenty five minutes to get there once onboard the Ferry. When you arrive in St. George’s just walk over to K.S. WaterSports which is located at the White Horse Pub & Restaurant. Please make sure you view the correct Ferry schedule times for that day and give yourselves plenty of time to get to our location at least a half an hour before your scheduled rental time. Alternatively you could use other methods of transportation like buses, taxies, mopeds, or mini buses if staying at hotels or guest houses. Our Cruise Ship docks in Hamilton but we have a Boat Rental booked already departing from your Hamilton location. How do we get to your Hamilton location? If you have a boat rental reservation booked already which departs from our Hamilton location, then walk over from the Hamilton Cruise Ship Terminal to our location, which normally takes around 10-12 minutes of light walking to get there. Our Hamilton water sports location is located at the Hamilton Princess Hotel & Marina. Give yourselves plenty of time to get to our location at least a half an hour before your scheduled rental time. Alternatively you could use other methods of transportation like buses, taxies, mopeds, or mini buses if staying at hotels or guest houses.